OXFORD, Miss. 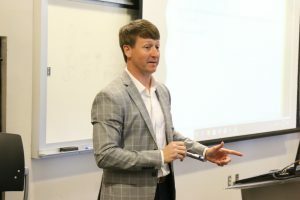 – The University of Mississippi School of Law is not only providing students with a premiere legal education, but it is also taking steps to improve the overall well-being of law students. UM Law recently signed on with the American Bar Association’s Well-Being Pledge Campaign, which focuses on the improved mental health of law students. Throughout this academic year, the law school has developed a wellness committee chaired by Kris Gilliland, law library director. The committee is composed of faculty members, administrators and a clinical professor to ensure that wellness initiatives are considered from all angles. “The diversity of the group is important so that wellness initiatives are discussed from a wide perspective,” Edmondson said. “Wellness needs to be implemented in the classroom, in extracurricular activities and in service to the community. During the 2018-19 academic year, the school has introduced a variety of wellness initiatives. The law school’s graduate assistant Shilpa Boppana, who is seeking a Ph.D. in clinical psychology, serves as the school’s wellness counselor. Boppana has walk-in hours for law students three days a week and provides free counseling on a wide range of issues including stress, sleep, anxiety, depression, time-management, study strategies and campus and community mental health resources. Additionally, the school hosts a weekly yoga class throughout the semester and events on how to improve sleep for better memory, mood and concentration. UM Law alumnus and wealth advisor David McPhail speaks to law students about managing a budget during a financial literacy program. The school also wants to reduce stress for students, even when they leave law school. Throughout the spring semester, the school has provided financial literacy pop-up classes for students. Topics covered include how to budget and how to manage student loans. Partnerships with other entities, including the university’s Counseling Center, the department of psychology, the Clinic for Outreach and Personal Enrichment and others, have made these programs possible. “For example, we have a mandatory session for all first-year students where the Director of the Mississippi Judges and Lawyers Assistance Program, our wellness counselor and students who are willing to share challenges of mental illness come together to help students recognize warning signs and know where to seek help, if needed,” Edmondson said.